Best Buy today launched a new two day sale that will run through tomorrow, September 30, and grants customers free shipping on orders $35 and over as well as fast one-hour in-store pickup on most items. As usual, Best Buy has a variety of Apple products discounted, including iMacs and iPad Pros from late 2015, and the iPhone 7 and iPhone 7 Plus. Below we'll list all of the Apple devices with markdowns in Best Buy's sale, as well as some notable deals on other products. The only iPad models on sale are the 32GB models of the 12.9-inch iPad Pro from late 2015, which is available for $549.99, down from $799.99. 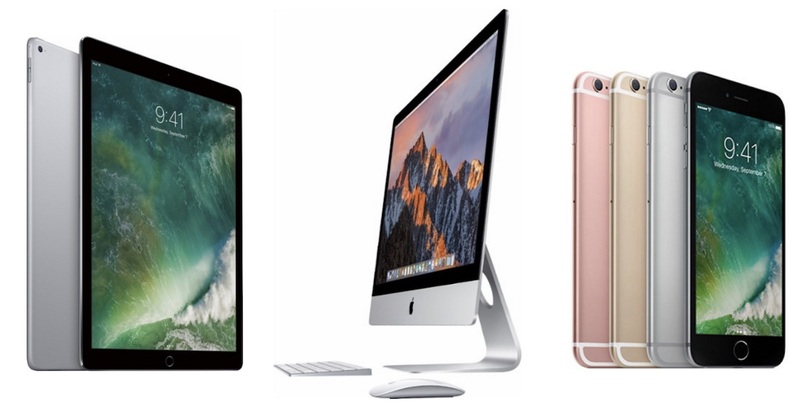 The sale is for Wi-Fi only models available in Silver, Space Gray, and Gold. For the iPhone 7 and 7 Plus deal, you can get $150 off Apple's smartphones from 2016 when buying and activating either device on a monthly installment plan. Only the (PRODUCT)RED color is available in 128GB. Best Buy's sale also has deals on numerous TVs, including a few 4K sets that will work with the new Apple TV 4K. There are three Samsung sets on sale, starting with the company's 55-inch LED Curved 4K Ultra HD Smart TV for $749.99, down from $899.99, then rising to the 65-inch LED Curved 4K Ultra HD Smart TV with High Dynamic Range for $1,599.99, down from $2,399.99. Brands like Sharp, Vizio, and LG all have 4K TV sets on sale today and tomorrow as well, with screen dimensions increasing to 75 inches. Discounts ending tomorrow also encompass Bragi's The Dash headphones, Bluetooth speakers from Sony and harmon/kardon, and more, so be sure to check out our Deals Roundup for more information before the two day sale finishes. In other deals-related reminders, Rogue Amoeba's 15th anniversary sale ends tomorrow, September 30; MacRumors readers can continue to get 15 percent off RAVPower's Qi Wireless Charger on Amazon through October 15; and our exclusive $308 discount off SOUND FORGE Pro Mac 3 continues through October 13. You also still have a few hours to enter our weekly giveaway for a Pad & Quill leather case for the iPhone 8, 8 Plus, or X, ending today at 11:00 a.m. Pacific Time. Cant wait for a day when all iMacs have PCI based Flash storage, or at least some kind of SSD in the base configuration. So, tech items came out from about 2 years ago are on sale? Not really, it is just fair price. You have an odd definition of "fair" price. The same 32GB 12.9 Pro on the Apple Store in REFURB condition is $589. $549 for BRAND NEW is a great deal. 2G is just too much better than the 1G and currently it is $100 off. Whether the 2nd gen is "too much better" than the 1st is a matter of personal preference. Is it "better"? yes. Is the price difference worth it? Depends. Make sure that you open the box in the store and that the device works. There is a history of Best Buy reselling returned merchandise boxes that don't actually hold the products that belong in the boxes. None of the iMacs on list currently supports APFS. SMH! They will when apple releases the High Sierra update for it. Craig F has said it will support fusion drives.